Helping others is a quality that resonates in Imelda Ojeda. That’s why she chose to pursue dual master’s degrees in public administration and social work in Arizona State University's College of Public Service and Community Solutions — not for the betterment of her career but to improve the quality of life for underserved families. 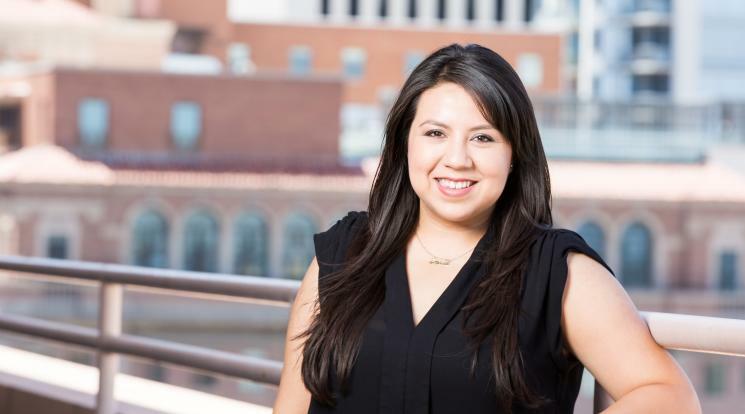 “With my bachelor’s degree I was able to help families one-on-one, but with a master’s I knew I could make a much bigger impact by working on the policy level,” said the 30-year-old, who was born and raised in Guadalajara, Mexico, and moved to Arizona to pursue her higher education. Ojeda is off to a good start. She serves as a board member for the Maryvale YMCA and is on the steering committee for the Maricopa County Preventative Health Collaborative. She is also in talks with the CEO for UMOM New Day Centers in Phoenix — whose mission is to prevent and end homelessness with innovative strategies and housing solutions — to create a new policy/advocacy position for her after nine months on the job as a housing specialist. She spoke to ASU Now about her time at the university. Question: What was your “aha” moment, when you realized you wanted to study the field you majored in? Answer: After obtaining my B.S in psychology, I started working in the behavioral health field working directly with children and families. During my time doing that I had the chance to experience firsthand how complicated and even frustrating the system in our state could be — families often have to overcome different barriers and obstacles to obtain the quality services and benefits they need. After being on the field for three years, I realized that my purpose was bigger than myself and that if I wanted to make a long-lasting impact and I needed to further my education and make the change I wanted to see. Doing a dual degree in social work and public administration (MSW/MPA) seemed like the perfect blend of direct services theory and practice and knowledge of non-profit and government management that would take me to the next level. Q: What’s something you learned while at ASU — in the classroom or otherwise — that surprised you, that changed your perspective? A: During my MSW program, I had the opportunity to take courses such as social justice and public policy courses that provided me with valuable knowledge on these areas and made me realize how much influence policy and politics have on our daily lives. I learned about complex social systems, and combined with my field experience I was able to target where some of the gaps in our system are and what needs to change in order to improve things in our communities. Additionally, being involved in student organization leadership during my grad school years has been a wonderful, challenging, learning experience. I have gained organizational and leadership skills that will allow me to continue making an impact and leading others on a professional and community level. Q: Why did you choose ASU? A: I chose ASU because I wanted to acquire the necessary skills to continue growing as a professional on the field. Having graduated from ASU with my undergraduate degree, I was confident that ASU is a quality institution and that this program would prepare me to continue serving and making an impact in the community in general. Q: What’s the best piece of advice you’d give to those still in school? A: My main piece of advice for those still in school would be to say yes to new opportunities. To not shy away from big challenges, say yes and figure it out afterwards. I have learned that great opportunities often only come once, and if we wait until we are ready to take them we might miss out on what will take us to the next level. My other piece of advice is to take the lead, to not wait for someone else to do it or someone else to figure out how to improve things. If you see a problem and it’s within your ability to step in and help, do it! We need more leaders who are committed and passionate about making changes now more than ever. Q: What was your favorite spot on campus, whether for studying, meeting friends or just thinking about life? A: Starbucks at Taylor Place is one of my favorite places to go to meet friends, but when it is time to study and get things done there is no place like that semi-hidden spot at the library on the Downtown Phoenix campus by the elevators. Q: What are your plans after graduation? A: Upon completing my MPA from ASU and along with my MSW, I plan on continuing working in the social-work field providing services to underserved populations and continue building my career in the public sector to address the unique needs of the Southwest population by developing policies and advocacy for access to quality health care, education and stable housing. I plan on continuing my employment with UMOM New Day Centers, where I enjoy working with homeless families providing support to maintain stable and safe housing and employment. Obtaining my MPA will allow me to seek other opportunities within the organization and plan on transitioning to an advocacy and public policy position where I will be able to make a larger impact within this community. Q: If someone gave you $40 million to solve one problem on our planet, what would you tackle? A: There are many things I would like to improve and problems that need to be solved, but if I had to choose one it would be to ensure access to quality health care for all children. I believe access to health care is a human right and not a privilege, and health care is the foundation for any social development. With $40 million I would develop programs that provide health-care services to children in rural areas, but instead of us providing all the necessary personnel and equipment, I would invest some of that money in helping communities develop, train and establish quality health-care systems that are sustainable and affordable. Long-term solutions vs. the traditional one-time direct/emergency services that we are used to. Providing health screenings and vaccines for children in poor countries is always a great help, but this does not solve the big-picture problem. We need to lead by example and assist these communities regarding best practices on how to build, establish and develop permanent health-care systems that will have a long-term impact.